Jax Furniture Refinishing & Upholstering’s team has decades of experience restoring antique furniture, refinishing wooden furniture of all styles and designs, and offering custom upholstering services throughout the greater Jacksonville area. Jax Furniture Refinishing & Upholstering is the home of master craftsmen William C. Kennedy III, Jacksonville’s foremost expert in the restoration of fine furniture, trusted by thousands for honesty, integrity, and a job well done. You can trust that we will care for your furniture as if it is our own, with the kind of attention to detail that leads to lasting quality in every upholstering and refinishing job that we do. We look forward to answering your questions and working with you every step of the way through your upholstering, furniture refinishing, or restoration job. Our Jacksonville, Florida based family business guarantees excellence in custom upholstering, furniture refinishing, antique restoration, and furniture repair. Our team consists of highly trained specialists who are committed to the highest standard of care for every job we do. Most of us have spent a lifetime caring for furniture, and our combined experiences are second to none in the city. Our services are backed by our 100% satisfaction guarantee for your peace of mind. We also carry full liability insurance so that your items are covered while they are in our care, whether while being transported for pickup or delivery, or while we are working on themin our furniture refinishing and upholstery shop here in Jacksonville. Our customer service staff is sensitive to the needs of our customers as well. We understand that while often we are called because a fun project is undertaken for improving design or aesthetic purposes, sometimes the project is result of damage that necessitates broken furniture repair. In either case, we take a consultative approach to working with your furniture. We can help you understand when it is better to replace your furniture and when to refinish your furniture. Simply put, while our upholsterers and wood furniture refinishing experts can make any piece of furniture look great, some pieces just aren’t worth it. But if you have a good piece of furniture, whether new or old, it’s almost always worth it. That’s why we offer a wide variety of services ranging from full restoration to general upholstery repair. While our refinishing and upholstery shop is located in Jacksonville, Florida, our service is frequently requested by customers with fine furniture throughout most of the Northeast Florida area, including Ponte Vedra Beach, St Augustine, Fleming Island, Orange Park, Fernandina Beach, and more. 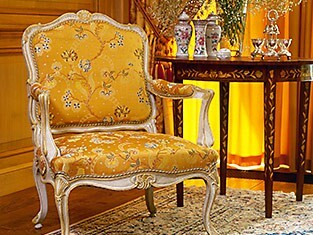 There are many benefits to our furniture upholstery services. Our upholsterers work on a wide variety of designs, including chairs, chaise lounges, ottomans, and your beloved sofa as well. The refinishing side is no different. While the variety is endless, our most common furniture refinishing project is, by far, the dining room table. We also do larger and more involved projects such as china cabinet refinishing. And while we primarily do antique restoration, refinishing, and upholstering work for residential customers, we also do commercial work and office furniture repair as well. As you can see, we can perform just about any type of work you can dream up on just about every type of furniture out there. Of course, please feel free to contact us at 904-416-1064 with any additional questions you may have. We look forward to providing you outstanding service!